"Her wattles turned bright red." Falling from a truck was probably the best thing that could have happened for Ivan the turkey. 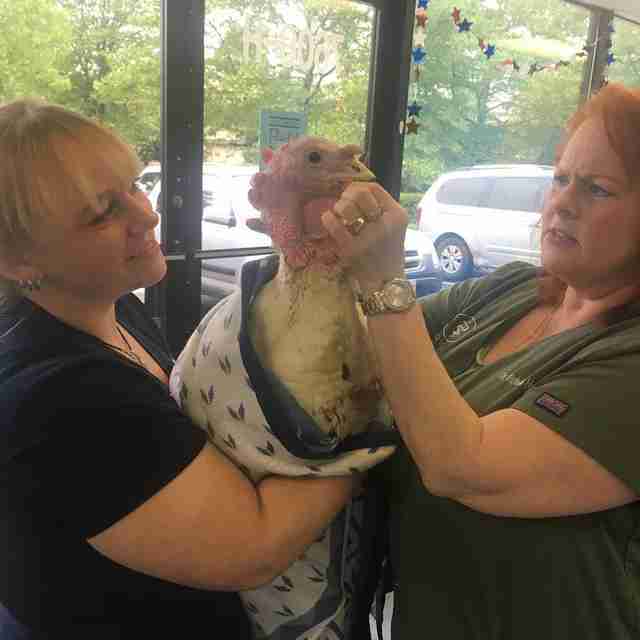 Ivan was recently packed onto a truck bound for the slaughterhouse when he somehow came loose and went flying onto the pavement of Interstate 83 in Maryland. He sat there, on the side of the highway, for probably 24 hours before he was spotted by someone who knew just whom to contact: Poplar Spring Animal Sanctuary. And it's a good thing they did — Ivan was seriously injured and would have certainly died if no one had stepped in to help. The people at Poplar Spring quickly coordinated a rush vet appointment for Ivan at Best Friends' Animal Hospital in Gaithersburg, where it was discovered just how much he loves it when people pet him and stroke his little head. It was also discovered, though, that his jaw was broken and his wing was mangled beyond repair. He was treated for his injuries by Dr. Victoria Hollifield, who very carefully cleaned up his wounds, wired his jaw and amputated his wing. "Ivan’s personality is really coming out now that he is beginning to feel better," Terry Cummings, founder of Poplar Spring, told The Dodo. "He likes to follow people, and loves to have his feathers preened where he can’t reach. He is very mischievous and likes to steal paper towels and run off with them. He enjoys getting petted and having his head massaged, he closes his eyes." Ivan is currently healing at Poplar Spring's infirmary, where he's getting to enjoy the sights around him. "He seems to like his new accommodations in the infirmary," the sanctuary wrote in an update. "He is fascinated watching the deer and cows go by in the woods. He will need to stay inside while his wing and jaw are healing, but he seems to be enjoying his room with a view!" Recently, Ivan had a brief opportunity to meet Coco the hen, who got a little sick. He came over to her enclosure and showed off his new shirt, which has a practical purpose — keeping his post-surgery wing wound safe from his curious little beak — but also suits him quite well, aesthetically. When Coco was feeling better, though, she went back with her little group of hen friends, and Ivan was on his own again — until sanctuary staff decided to introduce him to Madison. 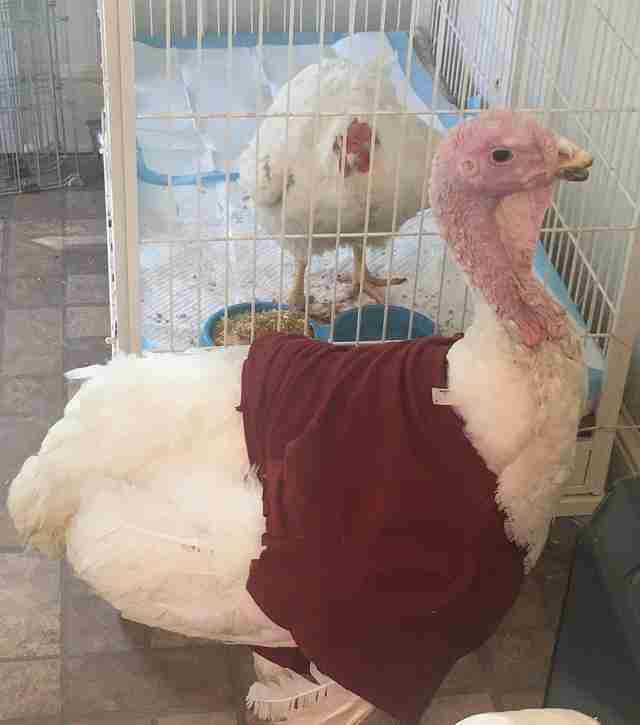 "Ivan the turkey was very lonely in the infirmary," the sanctuary wrote. 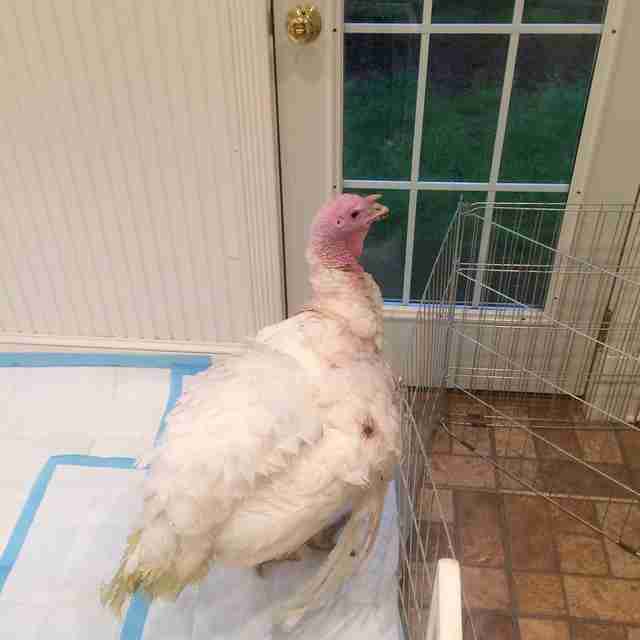 "We brought Madison, one of our lovely girl turkeys, to visit him through the door. He was interested, but I think she was more excited to see him — her wattles turned bright red. 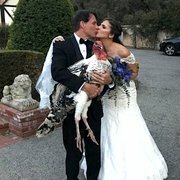 She’s never seen a big white turkey boy before!" Ivan continued making big strides toward recovery — to the point that he was even healthy enough to take his first steps outside, onto the lush grass of the sanctuary, his new home. He perked up immediately at the sights and sounds around him and happily soaked in some sunshine. His new girlfriend Madison was also there for the milestone. And it's clear their bond is growing stronger by the moment. 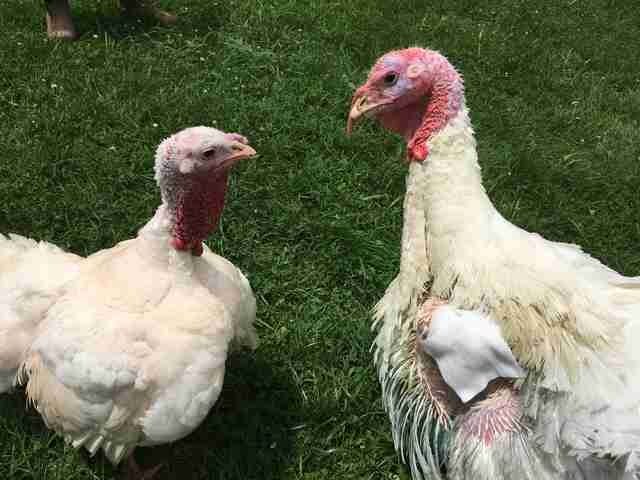 "He was especially interested in Madison, another rescued white turkey, who he had previously seen through the windows of the infirmary," Cummings said. "They did some 'turkey talk' and puffed up at each other." Once Ivan is fully healed, he'll be able to even meet a whole crew of feathered friends with rescue stories similar to his own. 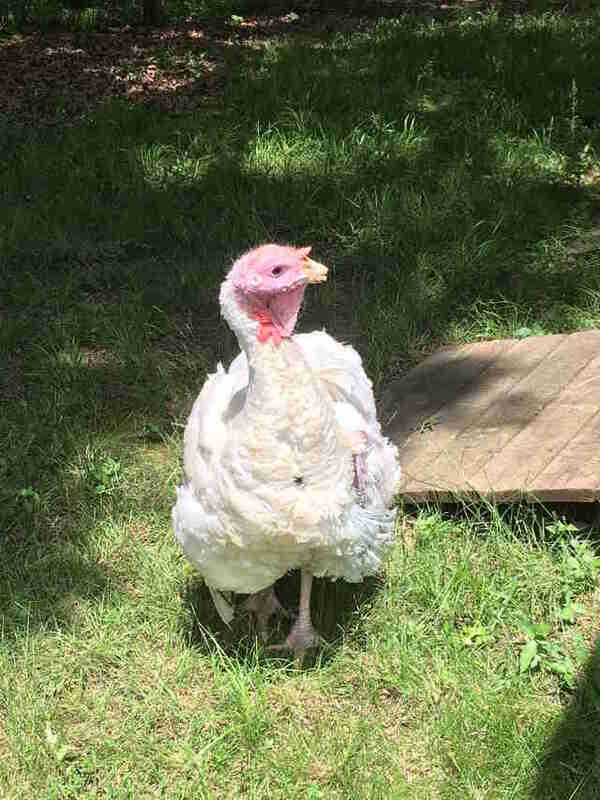 "We are so happy that this handsome turkey boy escaped a terrible fate and can now live a wonderful long life where he can scratch and peck in the grass and dust-bathe under the trees with his new turkey and chicken friends," Cummings said. "It’s a life that all turkeys deserve, but so few get to live. He is truly one of the very lucky ones." You can congratulate Ivan on his new home at Poplar Spring by making a donation to his care.